SHSMO's collection of editorial cartoons graphically and often poignantly reflects the attitudes and opinions of the artists and the citizens of Missouri. St. Louis Post-Dispatch cartoonists Daniel Robert Fitzpatrick and Tom Engelhardt often delivered cartoons with a strong social commentary on Missouri and national environmental issues and concerns. View a selection of the environmental Editorial Cartoons here. See the entire Editorial Cartoon digital collection online here. An important aspect of Missouri's environment is its climate and weather. Natural disasters such as earthquakes, floods, and tornadoes occur in Missouri and affect the land as well as its inhabitants, both human and animal. View a selection of Missouri tornado images here. View a selection of Missouri flooding images here. 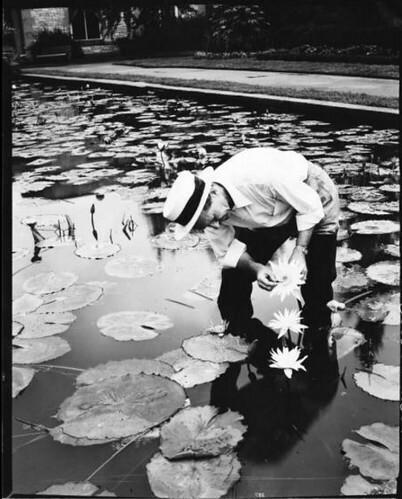 The Missouri Botanical Garden, located in St. Louis, was founded in 1859 by Henry Shaw. The Garden is a National Historic Landmark and acts as a public attraction as well as a center for botanical research and science education. The Garden boasts 79 acres of horticultural display, a 14 acre Japanese garden, and includes Henry Shaw's original 1850 estate home. The Missouri Botanical Garden is also the headquarters for The Center for Plant Conservation, an organization focused on preventing the extinction of America’s imperiled native flora and restoring vigorous populations to the wild. SHSMO photograph collections feature a wide variety of images depicting other elements of Missouri's environment, landscapes, and wildlife.